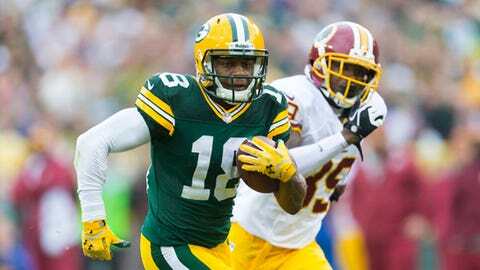 Packers wide receiver Randall Cobb (18) runs for a touchdown after catching a pass as Washington Redskins cornerback David Amerson (39) chases from behind during the first quarter at Lambeau Field earlier this season. GREEN BAY, Wis. — Randall Cobb took a big step forward in his recovery, but the Green Bay Packers’ star receiver is still a few big steps away from actually playing in a game. For the first time since fracturing his tibia on Oct. 13, Cobb practiced Wednesday. It was just last week that Cobb was finally cleared to run, so the player currently wearing the No. 18 jersey isn’t nearly up to the same high standard yet that he created for himself by leading the Packers in receiving last season. It’s highly unlikely that a player — especially one who relies on speed — can go from that level of health to being game-ready in a matter of days. While Cobb wouldn’t be any more specific about his timetable than to say he’s “taking it day to day,” it seems almost certain that he won’t be on the field for Sunday’s must-win home game against the Pittsburgh Steelers. Cobb, who was eligible to return from injured reserve last week, confirmed that he has not been medically cleared. It’s possible that he’ll only play in another game this season if the Packers make the playoffs. “I believe everything’s healed; just getting back into football shape and trusting myself,” Cobb said. Wednesday’s test was important for Cobb for those reasons. Overcoming the effects of a hit that made fellow receiver Jordy Nelson “sick” isn’t an easy thing for Cobb to do. “Definitely there’s a mental block that I’ve got to run through,” Cobb said. “I’m at the point where I have to continue to work and continue to trust my body and trust that I’m healed. Though Cobb mentioned his knee, that’s not the area of his injury. However, given the location of the tibia and the knee, it’s an indication of how impactful the injury can be to a player. As soon as Cobb was hit near his knee by Baltimore Ravens safety Matt Elam in Week 6, Aaron Rodgers took issue with it. “I just felt like (Elam) had enough time to make a hit in the legal hitting zone,” Rodgers said in his postgame press conference. “Now, the other safety came over and made actually a very knowledgeable point, which I appreciated a little intelligent banter back and forth, about some of the issues defensive players have to deal with in the target area. I totally understand that and get that. The NFL did not fine Elam for the hit, so the complaints from Rodgers fell on deaf ears at the league office. Nelson searched for a solution that might not allow injuries like Cobb’s to happen in the future. While that discussion is tabled for down the road, Cobb’s nine-game absence will likely become 10 missed games by Sunday. With the Packers’ regular-season finale in Chicago also quickly approaching, Cobb will have to hope that he sees a lot of progress in the next week.